The Pine Tar Game chronicles this watershed moment, marking a pivot in the sport, when benign cheating tactics, like spitballs, Superball bats, and a couple extra inches of tar on an ash bat, gave way to era of soaring salaries, labor struggles, and rampant use of performance-enhancing drugs. Filip Bondy paints a portrait of the Yankees and Royals of that era, featuring two diametrically opposed owners, in George Steinbrenner and Ewing Kauffman; a host of bad actors and phenomenal athletes; and lots of yelling. Players and club officials like Brett, Goose Gossage, Willie Randolph, Ron Guidry, Sparky Lyle, David Cone, and John Schuerholz offer fresh commentary on the events along with their take on a rivalry that culminated in one of the most iconic baseball tantrums of all time. Rush Limbaugh, employed by the Royals at the time as a promotions director, offers his own insider’s perspective. 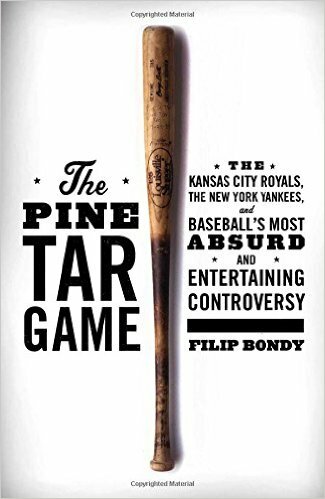 Through this one fateful game, the ensuing protest, and ultimate fallout, The Pine Tar Game examines a more innocent time in professional sports, as well as the shifting tide that gave us today’s modern iteration of baseball.